Continuing our serialised life of Mgr. Lefebvre as told to the Sisters of the Society at St. Michel we look this month at Fr. Lefebvre’s return to Europe where he becomes rector of a seminary there before being chosen as Vicar Apostolic in Dakar. “You’re right”, I said, “I’m amazed there’s nothing for the boys”. So, I looked around and a year later I left again for France to meet the Marist Fathers and especially Fr. Thomas, the superior for the French Province who lived in Saint-Brieuc [in the North West of France]. “Come on, my Lord, come with me, I’ve got something to tell you”. “Come, come on, let’s go to a parlour”. “Now, don’t say no! You have been appointed Apostolic Delegate by the Pope? “You will be responsible, under the Pope, of all the French-speaking dioceses in Africa. You’ll have to start making contacts. Anyway, it’s very simple, the Pope is waiting for you in October. You’ll have to go to Rome. The Pope will receive you there and then you’ll visit all the offices in Rome. They’ll tell you what you have to do”. “Now, you can’t say no! It’s an honour for our Congregation, we’ve never had an Apostolic Delegate! “Ok, I’m game… (Oh my, this is going to be great, oh dear, oh dear). So, I set off to see the Holy Father. 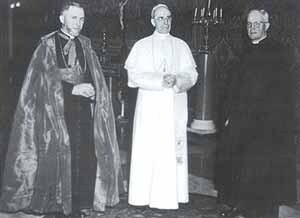 The Holy Father received me like a true father and I immediately felt that we thought the same way and that we both wanted to extend our Lord’s reign and live a truly Christian life, a truly priestly life… I was really touched by this visit to Pope Pius XII. We spoke and he told me that he was entrusting me with the evangelisation of the whole of Africa; that obviously I wouldn’t have to give orders, just visit. Then I would have to give an account of everything I had seen and heard, giving suggestions for the development of the evangelisation, encouraging the bishops, and even set up bishops’ conferences in the various regions. “Anyway,” he went on, “the Cardinal Prefect of the Propaganda will tell you everything, you’ll have to go and see him; he will give you very precise instructions”. In any case, he hoped that it would be a very good, profitable and fruitful time together; he was ready to meet me and help me if I needed it. Then he gave me his blessing. So I went to see the Cardinal Prefect of the Propaganda who explained the situation to me in great detail. My goodness, I was just looking forward to a quiet time in the diocese of Dakar, looking after my diocese… “You’ll get an auxhiliary” they said. And two years later I actually did get an auxhiliary, in 1950, Mgr. Guibert whom I consecrated in Dakar cathedral and who obviously helped me in the diocese since I was practically never there. You can imagine, I was always on the road; visiting dioceses, getting the bishops together – 46 dioceses was quite a lot – and they were spread out: Madagascar, Reunion Island, Djibouti, Morocco, the whole of French equatorial Africa, the whole of French West Africa, Cameroon. I needed weeks and weeks to make these journeys, as you can imagine.